Why buy a 4 stoke leaf blower? Which 4 stroke leaf blower is best? We answer these questions and much more. Homeowners love their power tools because they help them keep their yards clean and manicured. Imagine a life without your leaf blower or chainsaw or lawn mower. Your home would quickly turn ugly. 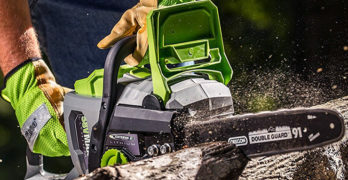 Power tools are essential for homeowners, unless you’re rich and you can afford to hire someone else to do the work for you, but most people do the work themselves. A variety of garden tools make our lives easier every day. One particular job that everyone hates to do is raking up the leaves that keep falling of the trees in our backyard. That’s why come very fall a man’s mind wanders towards the one tool that would make the job so much easier: The leaf blower! A leaf blower is often just called a blower. The device is designed in such a way that air is propelled out of its nozzle. This air can be directed at debris and at leaves. The force of the air pushes them in the direction you want them to go. This reduces a lot of your work. The original leaf blower was designed to be an agricultural chemical sprayer. This was way back in the 1950s. The design was later changed to a leaf blower after manufacturers found their clients modifying the agricultural chemical sprayer. The potential that the new design held was amazing and the manufacturers were quick to capitalize on it. Today, the leaf blower is powered by either gasoline or by electricity. The engine used could be either a 2 stroke engine or a 4 stroke engine. We will discuss the engine in depth in a little while. Most of the leaf blowers today are designed to be held in the hand. That is why ergonomics plays a very important role. A few of them are also backpack units. This means that you can wear the device like a backpack and your hands are free to direct the nozzle. Large units are usually too cumbersome to be carried around by hand. That is why they are usually equipped with wheels. Some even use a motor to propel the device forward. The main concept that leaf blowers use in their functioning is centrifugal force. Both the gas powered leaf blowers and the electric powered leaf blowers are located within the blower’s casings. The motor spins a fan rapidly and causes the outside air to be drawn inward. The air is then propelled forward through a small orifice (the nozzle) and is directed at the leaves on the ground. The difference between the sizes of the two openings combined with the force of that the fan generates pressurizes the air to a great extent. When this pressurized air leaves the blower it can reach up to 250 miles per hour in some leaf blowers. Leaf blowers either use electricity or gas as a power source. Most of the smaller leaf blowers use electricity. These small leaf blowers are designed for residential use. This is because electric leaf blowers can produce less power when compared to the gas powered leaf blowers. They are less cumbersome because electric leaf blowers do not require a fuel tank to operate. This means that they are smaller and easier to handle. Some of these devices even come with a battery backup. This means that they can be charged and then used. Since you don’t require the power cord, these leaf blowers are extremely portable and easy to handle. When you look at the larger more powerful leaf blowers, you are looking at most of the gas powered options. These could either be the 2 stroke leaf blower models or the 4 stroke leaf blower models. These leaf blowers are meant for heavy duty tasks because the produce a considerable amount of power. 2 stroke leaf blower engines and 4 stroke leaf blower engines are also commonly known as ‘Two cycle’ and ‘Four cycle’ engines. The differences between both are fairly simple to understand. Leaf blowers with a 2 stroke engine have a few main points in their favor. 2 stroke leaf blower engines use a mixture of gas and oil to run. Leaf blowers with two stroke engines are known to be more powerful when compared to their 4 stroke leaf blower engine counterparts. They are easy to design. You will find that they are also cheap to build. This is because the engine has fewer moving parts when compared to 4 stroke leaf blower engines. Fewer parts mean that the device is lighter. Lighter machines mean better portability. Cheaper, more affordable to buy. While 2 stroke engines have their advantages, there are two prominent disadvantages that come with the package. The engine produces a loud sound when it is on. This means that neither your neighbors nor your family will be a big fan of the sound it produces. The mixture of oil and gas that is used to fuel the engine is responsible for excessive emissions, polluting the environment. While leaf blowers with a 4 stroke engine are less commonly used, you will find that they have a few advantages that you cannot ignore. The 4 stroke leaf blower engines have a separate compartment for oil and a separate compartment for gas. This means that you don’t have to worry about getting just the right fuel-oil mixture. This means that the four stroke engines have greater fuel efficiency because the mixture isn’t hand mixed. This makes them more efficient. The oil does not burn off in the 4 stroke leaf blower engine like it does in the two stroke engine. That’s why the engine as a whole is more efficient. The efficiency of the engine makes the four stroke leaf blower engine more environment friendly. The downfall of the leaf blowers with 4 stroke engines lie in their weight and portability. Since the engine is large, you will find that these leaf blowers are heavier. While the problem of weight could be resolved with smaller engines, it is important to note that smaller engines will not be able to produce the same kind of power that a similar sized two stroke engine could produce. Since the engine is based on a lot of moving parts and each of the moving parts is expensive, the products as a whole are expensive. This makes a significant difference when a person is faced with choices when he/she is buying a leaf blower. Before we start the actual differentiation, it is wise to understand the leaf blowers are categorized based on their power. To do that we need to know what is the unit of power that they use. CFM: The CFM of any leaf blower refers to cubic feet per minute. This is a method of describing the power of the device. An increase in the air entering the machine in turn means that there is an increase in the amount of air that leaves the machine. This translates into a greater power. That is why the term ‘cubic feet per minute’ (i.e. of air) is a good way to measure the device’s power. Based on the unit of power the leaf blowers are differentiated as Sweepers, Light duty, Medium and Heavy Duty and Professional. Let’s take a look at the different categories. Sweepers: The least powerful leaf blowers are also by default the smallest leaf blowers. These machines are often referred to as ‘Sweepers’. They are available in all variants: Gas, electric and cordless. The CFM rating in these leaf blowers is less than 200. These Sweepers are good for light work like cleaning up a patio, a pathway or a deck. Light Duty: These leaf blowers have a CFM that lies within the range of 200-400. They are designed for light work and work either by using electricity or gasoline. They work well in yards that are under a quarter of an acre in size. Add in a number of trees and the light duty leaf blower may not function optimally. Medium And Heavy Duty: If a leaf blower lies in the range of 450-500 CFM then it is classified as a medium or heavy duty leaf blower. These leaf blowers are effective in yards that are around an acre in size. Interestingly, they can also be used for smaller tasks too. Since they are more powerful, the device is in variably bigger and heavier. This makes it difficult to handle for extended periods of time. Professional: These leaf blowers are designed to be strapped on to the back in a way that is similar to a backpack. They have a CFM rating that is above 500. Their portability and high power means that they can be used over large areas without discomfort. The noise that they make however makes them unsuited for use in residential areas. The area to be cleared. The size of the debris. I’m sure that everyone got the first point right. The second two may have come as a surprise. The area to be covered will tell you how powerful the leaf blower should be. Large debris is not easily moved by small leaf blowers. They require a higher powered engine. So even if you have a small area that needs to be clean but the debris are big, you may need to consider buying a bigger more powerful leaf blower. The surrounding circumstances play a large role too. A large number of trees mean that there will be more leaves. More leaves means that a small leaf blower may not be able to do the job for you. That brings us to the topic of choosing the right power source. Each of the power sources has their own advantages and disadvantages. Selecting one for yourself is a relatively easy task. Cordless Leaf Blowers: Short duration chores (i.e. under 15 min) can be done using the cordless variety of leaf blowers. Bear in mind that their power is limited. They also need to be charged every 15 minutes. Electric Leaf Blowers: These leaf blowers have a power cord that is attached to them. This means that you need a power source nearby. In case the power cord is short, you will also need an outdoor extension cord. However, going beyond the range of the extension cord is said to be difficult and even dangerous. They however are quieter than their gas powered counterparts. Gas Powered Leaf Blowers: These leaf blowers are a perfect mix of portability and efficiency. They work well when you want to cover more a radius of more than 150 feet from a power outlet. The downside of these leaf blowers is the noise that they produce. To safely use a leaf blower, the user must read and understand the manual carefully. It is also important that you loan the leaf blower only to people who know how to operate it. Improper use of any leaf blower can cause physical harm to the user. The device is not recommended to be used by users below 18 years of age. There is no particular protective equipment that needs to be used. The user must however wear fully functional clothing. It should be tight and yet it should not be restrictive. The concept behind this is that loose clothing can get sucked into the fan with disastrous consequences. This is also the same reason why people are advised against wearing jewelry and leaving their hair when using the machine. Protective equipment also extends to protection for your eyes. Even though the gust of wind is directed away from you, there is always a chance that a piece of debris can strike something and ricochet back at you. That is why protecting your eyes is paramount! You will be aware of the fact that most 4 stroke leaf blowers produce less noise when compared to their 2 stroke engine counterparts. That however does not mean that the 4 stroke leaf blowers are silent. Makita advises the use of sound barriers like ear plugs or even ear mufflers to avoid damage to your hearing. In case you use the 4 stroke leaf blower frequently, ensure that you get your hearing checked at fixed intervals. Remember… Prevention is better than cure! While using the blower, you need to ensure that there are no children in the range of 15 meters from the Makita 4 stroke leaf blower. This should also apply to animals and pets that may stray into this unsafe zone. It is also not advised to use high powered leaf blowers in urban areas. The blower should be used in areas which are well lit. Do not use the leaf blower in a terrain that is slippery or a place that has loose gravel as it increases the chances of falls. The method of refueling the gas powered leaf blower is also important. The device should not be refueled while it is on and the fuel should be kept well away from any flame in the vicinity. The petroleum based fuel should not come in contact with your skin or clothing. The gas powered leaf blowers should never be refueled in a closed room. This is because fuel gives off vapors. These vapors are highly combustible. A closed room increases the chance of the gas igniting and causing an explosion. This is also the reason why the blower must be stored in a WELL VENTILATED room. The fuel tank of the blower must also be emptied before storage. With the wide variety of leaf blower models that are available in the market, the choice to make the right choice becomes harder and harder each day. That’s why I’ve taken the liberty off compiling a few of the best models together. Husqvarna makes wonderful products and this is no exception. Lightweight blower with integrated backpack harness designed for landscapers & homeowners. 2.1 HP X-Torq engine reduces harmful exhaust emissions and increases fuel efficiency. Fan speed can be adjusted for easier handling; air purge removes air from carburetor and fuel system for easy starting. NOTE: You can extend your warranty from 2 to 4 years. If you purchase this Husqvarna 4 stroke leaf blower and you want to extend your warranty, you need to also purchase three 32 ounce cans of Husqvarna pre-mix fuel and register your product online. Learn more. Buy 3 bottles and extend your warranty to 4 years. Visit the Husqvarna site for all the details. The Husqvarna 350BT was designed to be a portable option among the leaf blowers. The backpack leaf blower is meant for people with large areas of land. Even the harness and the controls of this leaf blower are designed for high capacity as well as for ease of use. It functions by using a 2 stroke engine. The engine of the Husqvarna 350BT is an air cooled 2 cycle gasoline engine. You will find that Husqvarna uses these kinds of engines for all their leaf blower models. The Husqvarna 350BT uses a single stage filter (half wet) and a NGK CMR7H spark plug. It also uses a digital ignition. The engine operates at 2200 to 6100 rpm. The idling speed of the leaf blower is measured to be around 2200 rpm. If you look at fuel consumption, you will realize that this model consumes 1.04 liter/ hour. With a fuel tank capacity of 1.25 liters, you will find that you can work a little over an hour before you have to stop to refuel. One of the things that Husqvarna emphasizes on is checking the engine before you start it. While this may seem like a difficult job, the actual job requires checking to see if all the parts are securely fastened. The fuel line should be checked to see if there is any damage. Any leak in the fuel line could cause an explosion. Once you have checked the fuel line, divert your attention to the volute case and net. In case any foreign objects are present in this area, do not start the engine. They could cause a great deal of harm to the blades of the fan. When using the Husqvarna 350BT, keep your ears open. If you hear any sound that you deem odd, then stop the engine immediately. Your next step should be to contact a local dealer. Do not try to fix the device on your own. There are methods to reduce the blowing time. Many people suggest using rakes and brooms to loosen debris before you use the leaf blower. If the debris is dry and loose then this is not required. Too dry conditions however can result in a lot of dust. To prevent this, you can spray the area with a fine mist of water. Do not use the Husqvarna 350BT when you are on a ladder or on scaffolding. The pressure that is exerted by the air emitted by the leaf blower could cause you to go off balance. Another point that Husqvarna emphasizes on is cooling the engine down before storing. As can be imagined the engine gets very hot. If you touch any of these hot metallic parts, it could result in severe burns. That’s why this point has been included in the Husqvarna safety instructions. Very lightweight and easy to carry. High quality blower. High air volume (356 CFM) and air speed (145 MPH) for commercial-duty performance. View or download the MANUAL or PARTS LIST for the Makita BHX2500CA. The Makita BHX2500CA is a 4 stroke leaf blower which is designed to be powerful and fuel efficient. In fact, the fuel efficiency of this 4 stroke leaf blower can reduce your fuel consumption by almost 60 percent. As you can see the device is relatively very compact. Bear in mind that these dimensions hold true when the Makita BHX2500CA is not fitted with the blower pipe. The engine is an important consideration that you should take into account when buying a leaf blower. The Makita BHX2500CA is a 4 stroke leaf blower and functions using gasoline. The 24.5 cc engine is powerful and efficient. The engine can produce a maximum speed of 7800/min and can maintain an idling speed of 3500/min. It uses automobile gasoline to function. This means that the fuel is easily available. Since the 4 stroke leaf blower uses gasoline, it is wise to take a look at the fuel tank capacity before delving any further. In this case, the Makita BHX2500CA has a fuel tank capacity of 0.56 liters. With its fuel efficiency rate, you will find that you don’t have to refuel the tank often. The efficiency of the engine depends highly on the fuel oil ratio used. That is why Makita specifies which oil should be used by the user. In the case of the Makita BHX2500CA, the oil recommended is SAE 10W-30 oil of API classification. You can use oil that is classified as SF or higher. These oils are generally used for 4 stroke automobile engines. The engine uses a solid state ignition and a NGK CMR6A spark plug to function optimally. The user must start the blower in accordance to the instructions given by Makita in their manual. The blower must not be started before the whole device has been assembled. Attach all the accessories and recheck the attachments before starting the device. In case, you think that there are any engine problems, stop the device immediately. Your grip on the handle needs to be perfect too. Hold the handle tightly and keep the cord in control by ensuring that you secure it with your thumb and your forefinger. Keeping your hand in this position ensures that you have the blower in your control at all times. Remember that the blower is emitting air with force. This force can make it difficult to control. When you need a rest, ensure that you switch off the device. The inhalation of exhaust gases can be toxic. This is because the byproduct of combustion contains carbon monoxide. That is why you should never operate the blower in an enclosed space. It is also the reason why you should not operate a machine with a faulty exhaust muffler! For the safety of yourself as well as bystanders, ensure that the nozzle of the blower is pointed away. It is also important to note that no sharp objects are inserted through the air intake inlet. This can damage the fan of the device. Clear those leaves like there’s no tomorrow! 32cc Troy-Bilt 4-cycle engine generates up to 500 CFM at 150 MPH without the need to mix gas and oil. Ergonomic design allows you to work longer and still be comfortable. Fully-tensioned multi-material suspension system distributes weight evenly and comfortably between shoulders and hips. Compression-release technology makes for easy starting. View or download the MANUAL for the TROY-BILT TB4BP EC. The Troy-Bilt TB4BP EC is a 4 stroke leaf blower which is powered by a 32 cc engine. This powerful 4 stroke leaf blower falls in the backpack design category. This particular model is popular because it is designed to prevent user fatigue. 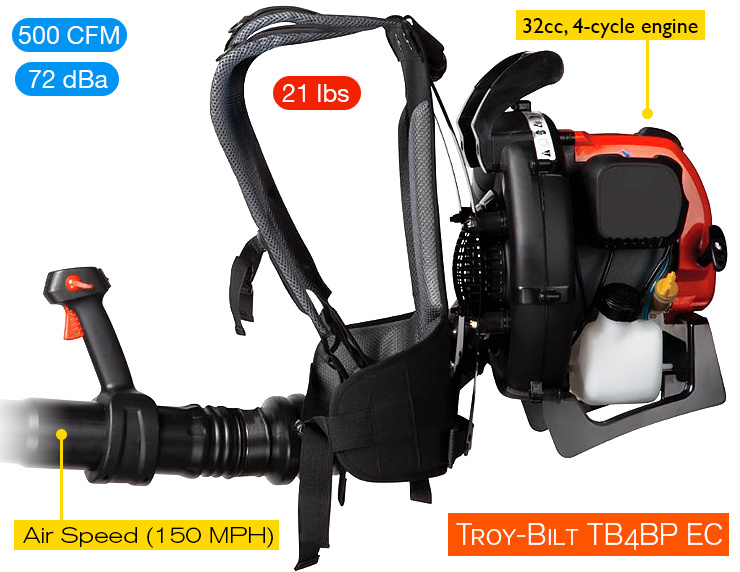 As mentioned before, the Troy-Bilt TB4BP EC is a 4 stroke leaf blower. Some may refer to it as a 4 cycle leaf blower too. The powerful 32cc engine comes with a jump start capability. It also has a slicer choke. A big difference in this model is the ability to adjust the speeds. With a 500 CFM model in your hands this means that the Troy-Bilt TB4BP EC can be used for both big and small jobs. Since the Troy-Bilt TB4BP EC is a 4 stroke leaf blower, you will find that the need to mix the fuel and the oil does not exist. This means that the proportions that are used are mixed by the engine itself. This gives a higher accuracy and lower fuel consumption. The fuel tank is unleaded and can store up to 768 ml of fuel in it at a time. The noise produced by this 4 stroke leaf blower is around 72 dBA. This means that you need to wear some hearing protection like ear plugs or mufflers. The weight of the 4 stroke leaf blower without fuel is estimated to be approximately 6.8 kgs. This can largely be attributed to the smaller fuel tank that it has. The light weight of this device means that it can be carried with relative ease. The fully tensioned multi-material suspension system goes a long way towards distributing the weight of the 4 stroke leaf blower evenly. In addition to the typical backpack design, the Troy-Bilt TB4BP EC has a padded hip belt. This fits the shape of your hips and is designed to reduce pressure on the pressure points. Thus relieving fatigue! Troy-Bilt gives a few starting and stopping instructions when they talk about operating their 4 stroke leaf blower. Let’s take a look at some of those instructions. Before you start the engine of this 4 stroke leaf blower ensure that you check the oil levels in the crank case. The fuel tank of the Troy-Bilt TB4BP EC should be filled with clean, fresh unleaded gasoline. Once these checks are done you can move on to the primer bulb. The primer bulb must be pressed and released slowly. Do this ten times. Once this has been done, you will see some fuel in the primer bulb. In case for some reason fuel is not visible, pump the primer bulb again till you see some fuel. After all this, move the choke lever to position one and ensure that the device is idle. Now crouch into a starting position. The starter rope must now be pulled 5 times. Ensure that you pull it in a controlled motion. The choke lever must now be moved to position number 2. Once again pull the starter rope 3-5 times. Squeeze and hold the trigger. You can also hold down on the cruise control. DO NOT squeeze the trigger before the previous steps are completed. The engine will take 30-60 seconds to warm up. You can start the 4 stroke leaf blower after this. The stopping instructions of the 4 stroke leaf blower are far simpler than the starting instructions. All that you have to do is release your hand from the trigger. Once the engine is cooled, you can switch it off by pressing and holding the On/Off switch. The Makita BBX7600N is a 4 stroke leaf blower with a powerful 75.6 cc engine. Unlike the previous Makita model that we discussed, the Makita BBX7600N can be carried on the users back. That’s why it falls under the backpack category of leaf blowers. The padded shoulder straps and the back panel that are incorporated in the design help in improving operator comfort. The Makita BBX7600N weighs approximately 10 kg It is relatively heavier than most of the 4 stroke leaf blowers that have been discussed. This is because the Makita BBX7600N is made for professional use. The need for more power translates into the need for a larger engine. Comfortable to wear for extended periods of time. The engine of the 4 stroke leaf blower runs by using automobile gasoline. The oil that is used to mix with the gasoline is SAE 10W-30 oil of API classification. This can be class SF or higher. It is basically the same oil that is used for automobiles. 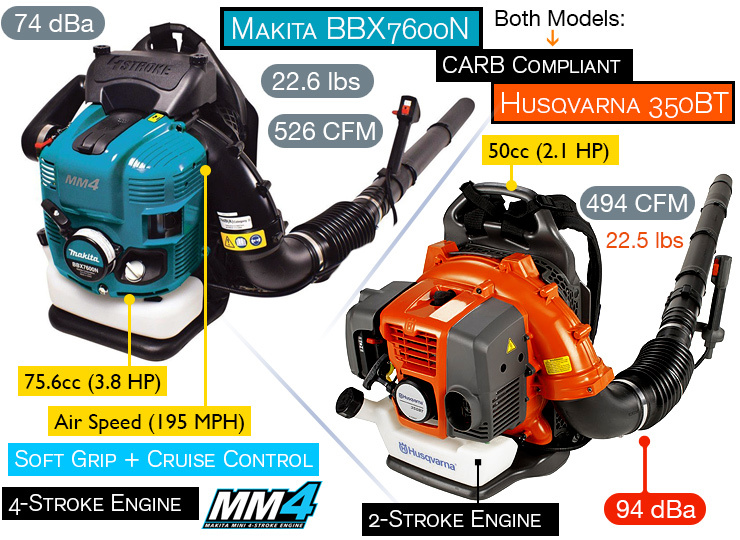 The engine of the Makita BBX7600N can produce a high air volume that goes up to 526 CFM. The engine has an idling speed of 2800 per min while the maximum engine speed is 7200. The next thing that we should look at is the spark plug. The spark plug used in this 4 stroke leaf blower is NGK CMR6A. Many people ask about the noise levels of professional leaf blowers. In the case of this leaf blower it is 74 dBA. Makita gives us a few instructions when it comes to handling this particular 4 stroke leaf blower. SHOULDER STRAP: The length of the shoulder strap should be adjusted so that it suits your height and your arm length. This will help ensure comfort while operating the Makita BBX7600N. CONTROL LEVER: The control lever as well as the swivel pipe can be adjusted. These adjustments are made so that the user can maximize their comfort while they are operating the Makita BBX7600N. BLOWER: The blower is operated by adjusting the throttle bar. This helps to adjust the wind force. The wind force needs to be adjusted according to the work location and the conditions in the vicinity. A good guide is the fact that low speeds are used for dried leaves and grass. Higher speeds on the other hand are used for gravel and dirt. The Makita BBX7600N has a cruise control. This helps the user to maintain a constant engine RPM. When you lift the cruise control lever you increase the engine’s RPM. Lowering the cruise control lever has the opposite effect on the RPM. Leaf blowers are excellent tools that reduce our manual work significantly. The use of leaf blowers however should be undertaken by adults. This is because the improper use of a leaf blower can cause grievous harm. The choice between buying a good leaf blower depends on the area you need to cover and the type of debris that you need to remove. Residential choices and professional leaf blowers vary in the power that they provide. The difference between 2 stroke leaf blowers and 4 stroke leaf blowers must also be considered. If you keep these points in mind, you will find that you can narrow your search down significantly. Once you select and buy the leaf blower of your choice ensure that you get acquainted with the safety instructions and the operating instructions. This will ensure that you get optimum performance.